It was the 29th Annual Apple Harvest Festival here in Ithaca this past weekend. I love Apple Fest. Like seriously. But this year was a bit less enjoyable because of the cold and rain but hey, that’s living in Ithaca for you. I got a gorgeous 1/4 peck of apples and when I saw the “Apple Honey Challah” post on Smitten Kitchen this week it was just too perfect. 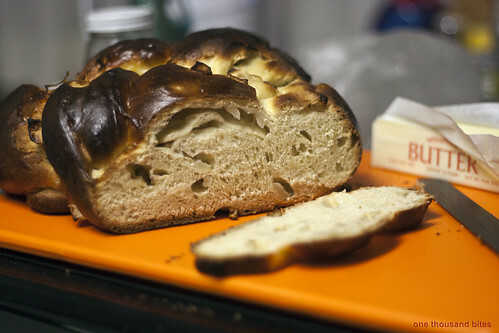 I’ve been dying to make a challah bread for ages and the timing of this loaf couldn’t have been more perfect. 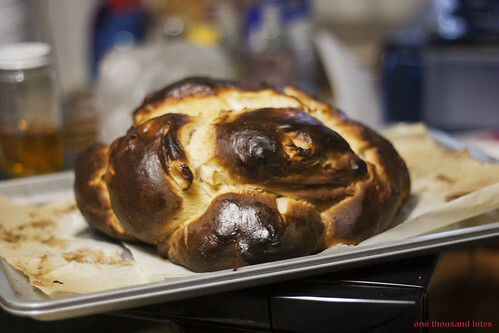 I was also excited because it only made one loaf instead of Deb’s other challah recipe which made two… or at least that was the plan. In my excitement of making this wonderful bread (and in not using actual measuring cups) I accidentally added 1 2/3 cup of water rather than the called for 2/3 cup. I frantically put my 9th grade algebra to use to calculate how much of everything else I needed to add to make it right. Oh my gosh was that an adventure. I ended up using 1350 grams of flour, needless to say (if you understand weights and baking) this means my new bag is looking a little slim. So instead of one loaf of challah, I had two beautiful round apple honey challah loaves. By hand:: In a large bowl, whisk together yeast mixture, oil, remaining honey (1/3 cup), eggs and yolk. Add flour all at once and stir with a wooden spoon until you get a craggy mass of uneven dough. Turn dough out onto a floured counter and knead it into a smooth, elastic dough, about 5 to 8 minutes. Try to use as little flour as necessary when kneading the dough; you don’t want to toughen the bread. A bench scraper can make it really easy to remove it from the counter if it gets stuck in a spot. Also using a pastry sheet seems to work really well, if you happen to have one of those. 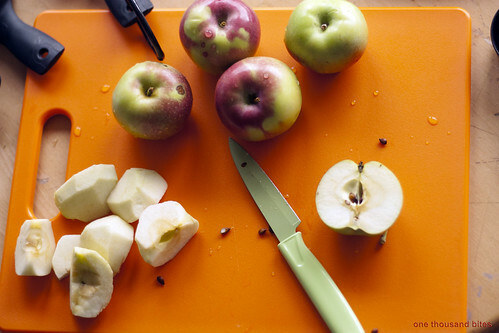 Add apples to dough: Turn dough out onto a floured counter and gently press it down into a flat, oblong shape. The shape does not matter so however it goes, it goes. Spread 2/3 of apple chunks over 1/2 of the flattened dough. Fold the other half over the apple chunks and press the dough down around them, flattening the now lumpy dough. Spread the remaining 1/3 apple chunks over half the folded dough. Fold the other half over the apples, pressing the dough down again. Your dough packet will likely be square-ish. Fold the corners under with the sides of your hands and form the dough into a round. Upend your empty bowl over and set it aside for another 30 minutes. Just a little PS of proof that I do bake everything in my dorm building. 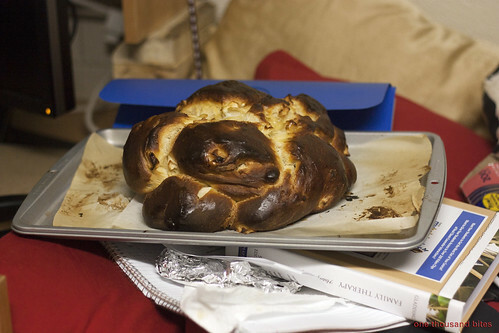 There’s my Family Dynamics homework sitting underneath the challah. Happy eating!